Today I’m interviewing Brady Koch, author of “Guns, Gods and Robots”. Welcome! I’ve been writing fiction for about three years now. I’ve dabbled in it here and there before that time, but never to the point where I thought I’ve had anything complete enough to share. I love what I’d call classic Americana science fiction: robots, trips to nearby planets and the apocalypse. What can I say? I’m nostalgic for Twilight Zone style stories. I love nonfiction books, but can’t quite determine a good subject to tackle. I like the Mary Roach style of nonfiction book that’s a blend of journalism, research and first hand storytelling. Perhaps I can find something fun to tackle over the next year. Guns, Gods & Robots is my first collection of sci-fi short stories and novellas. The diverse concepts may be unusual or disturbing but at the center of each story is a very human character faced with a set of really difficult decisions. As much fun as it was to write about automatons and living in a bunker, I really enjoyed trying to give these flawed characters some real emotions. My favorite in this collection is Cid’s wife Bess. Cid is trying to troubleshoot a very corrupted robot and not getting anywhere for his efforts. While he’s racking his brain though the majority of the story, she’s calm and collected and true to her beliefs. These kinds of steadfast characters may seem one dimensional, but I really like how she turned out and is the kind of person I’d like to have in my circle of friends. My least favorite was Clint in Popular Mechanics for Young Widows. The first draft was much longer and I even shared it on Noisetrade. Reading it again, Clint came off as too villainous. Almost like he was twirling his moustache the entire time. I took the novella down from all stores and drastically reworked it. Clint was overhauled and his actions and intentions are more nuanced than previously. His actions are greyer than in the first draft, and I’m happier for it. Life is rarely black and white. I tend to write long then cut the stories down to the bone. This obviously results in a shorter story, but I like how condensed they are. Think of these as a collection of bonsai trees. This book took about two years. There were quite a few stories I wrote that didn’t make the cut for the final seven. Some I’ve published on my site and others I might revisit in a year when I’m assembling a new themed collection. My wife is my main editor. She’s incredibly direct with her feedback and it’s quite a help. My stories are the stronger for it. Not a series per say, but there are shared worlds that these stories belong in. Numbers 16:32 and Timothy both have shared elements. I’m already outlining a novel that exists in the world of one of these tales. Be brave and share your work with strangers. Try out a local writers group or a site like OpenBooks.com or Noisetrade.com. I talk to a lot of hobby writers, that never take their manuscripts public even through the book has been 99% done for years. Don’t wait for perfection. I would say that each of these stories is based on my own fears under the guise of science fiction. The characters make as many bad decisions as good ones, and I like hearing from readers who share with me what choices they would have made in similar circumstances. I remember one of my more detailed reader letters dissecting Valerie’s actions in Popular Mechanics for Young Widows. She honestly read more into the characters motivations than I’d intended, but it was still one of the best feelings in my life to get to initiate this long conversation through one of my stories. I invite all my readers to do the same. . . I always worry about meeting an idol and them not living up to my idea of them in my head. With that warning, I’d love to meet/have met Kurt Vonnegut, Brian K. Vaughn, and Bill Bryson. I always like daydreaming and thought it would be fin to see if I could write formalize some of the stories that would roll through my hear. I started writing purely as a challenge to myself. I wanted to see if I could follow through with it and then self-publish. It’s feels freeing when the story is done and out of your head. Like checking something off of a list. I’m writing a quartet of novellas that all take place in the same high concept universe. Without too much away it’s about dreaming, blue-collar workers and hunting a serial killer who may not actually be serial killing. Guns: A girl’s birthday wish comes true when she gets to spend an afternoon on manhunt with her lawman father. Gods: An old man discovers his crops aren’t the only dead things on his farm. Robots: A heartless machine built for compassion malfunctions, leading its engineer on a hunt to fix the corruption before it spreads. In Guns, Gods & Robots, Brady Koch, mixes and remixes three themes across this collection of stories and novellas that spans the range of science fiction and horror. The stories, collected here for the first time, range from the uplifting to the horrifying. Sure to spark your imagination, the seven stories in Guns, Gods & Robots will also keep you up at night. If interested in reviewing, I am more than happy to provide the book in the eReader format of your choice. If there’s another way to send this to you let me know and I can accommodate. If short story and novella collections are outside of your scope of review, but you are still able to support my work as an independent writer, I’m more than happy to participate in an interview for your blog. Please let me know if you are interested. Brady Koch lives in Westchester County, NY with his wife and children. Feel free to read over Brady’s shoulder if you see him working on a new novel or short story at the coffee shop, library, or commuter train into NYC. Despite his penchant for crime, horror, and the unusual in his writing, he’s actually a nice guy and welcomes your feedback. 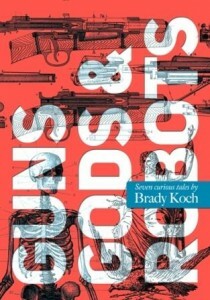 Brady Koch’s first collection of short works, Guns, Gods & Robots, is now available.